World 1-5 is the fifth normal level of World 1 in New Super Mario Bros. 2. 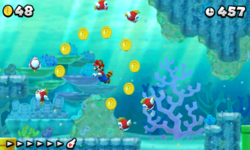 It is the first underwater level in the game, filled with Cheep Cheeps and the occasional Spiny Cheep Cheep. The player starts in front of a pool of water with a gold pipe going through the water. The level starts of with several coin rings and a Cheep Cheep. Moving on, the player can see a Cheep Cheep ring enclosing some coins. Another ring of Cheep Cheeps enclose a ? Block containing a Fire Flower, the main power up of the level. A Spiny Cheep Cheep will then appear which will follow Mario upon spotting him. A Coin Roulette Block follows with a Big Cheep Cheep, and more coin and Cheep Cheep rings. The player then reaches the checkpoint. Two ? Blocks are then found, the second containing a coin. Above the checkpoint, an area which contains a Cheep Cheep and coin ring enclosing a block that contains a 1-Up Mushroom, can be found. Two Cheep Cheep and coin rings will then be seen enclosing an ordinary Roulette Block. Two more coin rings appear, followed by a Spiny Cheep Cheep and a green pipe containing a stream of water. Above the area, before the latter enemies and coins appearing, an area is found where several coins lie on the ground. More Cheep Cheep and coin rings, and a lone Cheep Chomp follow. A P Switch (being blocked by the Cheep Chomp) can be activated to create blue coins in a circle which the player can collect. Mario will then see the green exit pipe back into land. Several stone platforms can help Mario reach the top of the flagpole. Star Coin 1: This Star Coin can be seen early in the level, near the first blue Cheep Cheep. Star Coin 2: Just after the Coin Roulette Block, the player should be able to see a gold Warp Pipe. The player needs to enter it from the opposite side of the wall because of the water stream from the green pipe. The Star Coin will be located at the bottom of the area. The player needs to be careful not to get sucked into the current. Star Coin 3: After the green pipe (producing a current) after the checkpoint, there is a Cheep Cheep ring. The player can see a platform on the ceiling above that ring. Mario should get to that platform and swim upwards to an area on land where the Star Coin is. This page was last edited on April 13, 2019, at 08:39.